Dohlaiy lost her children and grandchildren to the cyclone. She now lives together with 20 other survivors, in the only house that still stands amid the rubble of the former fishing village of Uomiou. One of its walls is missing. The survivors have no fresh water and just enough rice to get by. The rice, they told us, was donated by the neighbouring village, not the government. “We have two cups a rice a day per family. Its not enough,” Dohlaiy said. “We don’t know what to do, we don’t have a boat to get out of here, but we can’t stay here either,” another villager said. The cyclone has filled their rice fields with sea water, devastating the crops and stripping the people of the only source of livelihood they know. The state-controlled newspapers have been full of praise for the way the government has handled the crisis. The generals have tried to make sure that no-one is in a position to challenge their view. Army checkpoints block all roads to the Irrawaddy Delta. Foreign journalists have been thrown out of the country and no aid workers are allowed anywhere near the disaster area. “It makes no sense, it feels like they [the government] want these people to die,” said one aid worker, who asked not to be identified as he is waiting for the permission to go into the delta. 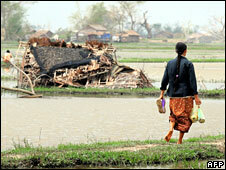 In the meantime, the UN says another cyclone could be on its way to Burma. A trail of wreckage and dead bodies stretched all along Burma’s Irrawaddy Delta. Two weeks on since Cyclone Nargis hit, the Delta is still devastated and hundreds of thousands of people are still waiting to be rescued. They are hungry and homeless not just because of the disaster, but because of the government that does not seem interested in helping them. YANGON: The Red Cross estimated that the cyclone death toll in Myanmar could be as high as 128,000 — a much larger figure than the government tally. The UN warned a second wave of deaths will follow unless the military regime lets in more aid quickly. The grim forecast on Wednesday came as heavy rains drenched the devastated Irrawaddy River delta, disrupting aid operations already struggling to reach up to 2.5 million people in urgent need of food, water and shelter. “Another couple of days exposed to those conditions can only lead to worsening health conditions and compound the stress people are living in,” said Shantha Bloemen, a spokeswoman for UNICEF. A tropical depression in the Bay of Bengal added new worries, but late in the day forecasters said it was weakening and unlikely to grow into a cyclone. Myanmar’s government issued a revised casualty toll on Wednesday night, saying 38,491 were known dead and 27,838 were missing. The International Federation of Red Cross and Red Crescent Societies, however, said its estimate put the number of dead between 68,833 and 1,27,990. The Geneva-based body said the range came from a compilation based on other estimates from 22 different organizations, including the Myanmar Red Cross Society, and on media reports. THE Burmese authorities have sealed off the cyclone disaster zone from the outside world, expelling foreign aid workers and placing multiple checkpoints along roads into the Irrawaddy Delta, to the despair of foreign diplomats and aid workers. The isolation of the delta confirms the growing sense among international organisations that the Burmese junta is never going to allow a wide-ranging foreign-led aid effort of the kind that was mounted in several countries after the 2004 Indian Ocean tsunami. Aid groups are trying instead to mount a stealth operation in which Western aid is distributed by government organisations, local aid workers, and international staff from countries that the regime regards as friendly and compliant. Time, though, is running out – not only to avert epidemics of infectious diseases such as cholera, but also to prevent a catastrophic failure of this year’s rice crop, 65 per cent of which comes from the cyclone-stricken area. UN chief Ban Ki-moon called an emergency meeting on the aid crisis yesterday to discuss a strategy for escalating the humanitarian response. BANGKOK – With an estimated two million people at risk of death by disease, deprivation or starvation and the scant amount of foreign aid that has entered the country diverted from those most in need, Myanmar’s worst case humanitarian scenario is now playing out in full view of the international community. As the death toll mounts and the United Nations futilely negotiates with the country’s ruling generals to open Myanmar’s borders and allow a multinational response to the Cyclone Nagris disaster, the moral case for a unilateral US military-led humanitarian intervention has grown. The the world today, the entertainment and coffee table discussion is Burma, Darfur and China. What entertainment these disasters have become. World governments admire China’s rescue and recovery efforts. World governments condemn the Myanmar Junta and Sudan’s genocide policies. Talk and talk everywhere while the world watches and waits for things to get worse. That really helps those who have no food, water or sanitation. There must be a death toll criteria before the world decides to take action. There must be a combined agreement to watch these disasters evolve into a global health threat before a decision is made to intervene. Cholera is already spreading. Starvation is spreading. crops are ruined and the victims are unable to support themselves in the meager way they are accustomed. Fishing is ruined until the waters recover from the toxic pollution. Isolation for victims without resources is a criminal act worthy of Geneva Convention intervention. The Junta has demonstrated its unwillingness to open up to world relief efforts. Oh yes, they will accept supplies and confiscate them while telling the humanitarians they have everything under control, its not as bad as it looks. Somehow a few journalists have managed to release more realistic information about conditions. Is there a monetary value on human life? Is there no consideration for the consequences of neglecting the health and welfare of so many? Will the world look back and see this as the start of a new pandemic? The water, fresh and salt travels to other communities. With that water comes more disease and suffering. Should the world wait until the entire quadrant of this planet is unusable? The human factor should not be dismissed as the consequences of poverty and tyranny. If the world neglects to act now, there will be little hope for recovery for decades. The world can stay aloof from personal emotion because no one knows the names of the casualties. That makes it easier to look to other issues, like oil and entertainment.